Good old potato crisps may still be one of the country’s favourite snacks. But these days they have plenty of competition from other vegetables. Like kale for example. Kale is one of the latest healthy food trends and with good reason. Kale is rich in antioxidants, calcium and vitamin A. But to be honest, it’s not all that tasty in its pure unadulterated form. 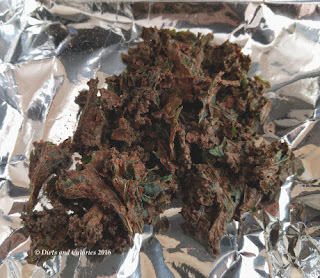 One of the tastiest ways of preparing kale is turning it into crisp form. 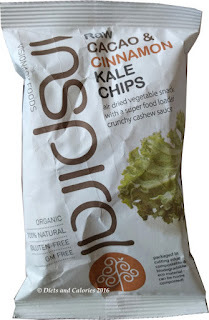 While there are many brands offering their own version of kale crisps (see review pret), my favourites so far are made by Inspiral. They make a range of different flavour varieties and they come in different sized packs. Great news is they are all low in calories. 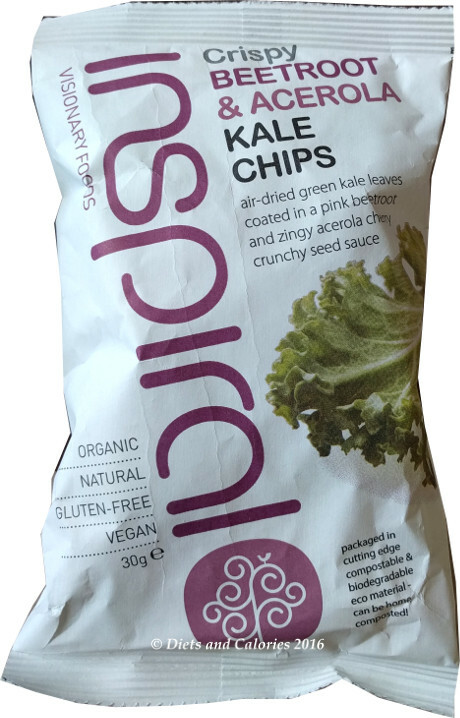 Inspiral Kale Chips are totally organic, gluten-free and suitable for vegetarians and vegans. The larger packs are called Kale Chips and these come in 60g and 30g packs. The smaller 12g packs are called Kale-Os. Celtic Sea Salt & Lime – 46 calories. Raw Cacao & Cinnamon – 130 calories (30g). I’ve munched my way through most of these flavours and my absolute favourite has to the Raw Cacao & Cinnamon. It’s quite amazing how a plain vegetable can be turned into such an ‘interesting’ snack. They’re somewhat weird to look at. My kids turn their noses up and make offensive noises when I show them these snacks. But when I do persuade them to give them a go, they are pleasantly surprised. 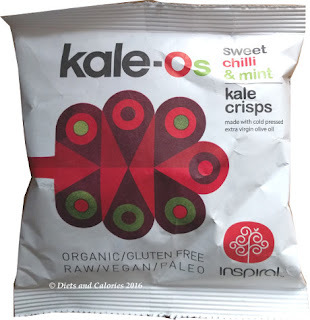 While natural kale is a very healthy vegetable AND air drying helps preserve nutrients, it has to be said that these snacks are actually high in sugar, salt and fat! However, the pack sizes are small, the calories are low and the ingredients certainly are real. By this I mean they are the sort of ingredients you can easily buy in a supermarket rather than some complex sounding chemical name. They’re sold in various health food shops such as Planet Organic and you can buy them in multi packs or singles online from the Inspiral shop. Ingredients: Sweet Chilli & Mint: Curly Kale (72%), extra virgin olive oil, deactivated nutritional yeast, coconut palm sugar, lime juice, fresh mint (3%), Himalayan crystal salt, onions, garlic, fennel powder, parsley powder, cayenne chilli (0.04%), organic (98.9%). Nutrition Information: Sweet Chilli & Mint (12g): 54 calories, 3.4g fat, 0.5g saturates, 5.3g carbohydrates, 2.2g sugars, 2.2g fibre, 1.7g protein, 0.4g salt, 20mg Vitamin C.